Thanks to reality TV shows like Top Chef and Mind of a Chef, some chefs have become bigger celebrities than ever before. Many are taking their newfound celebrity and using it as a platform to spread important messages about sustainable food. These chefs are running their own farms, working with farmers to bring back local ingredients, and advocating for sustainable fish and meat. Whether you’re interested in the farm-to-table movement, improving your own cooking, or just want to read about food, these seven books by sustainable chefs are sure to deliver. In Dan Barber’s recent book, The Third Plate, he envisions a radical transformation in food. Barber is the co-owner and executive chef at Blue Hill and Blue Hill at Stone Barns. At Blue Hill the restaurant is the farm, which means they change their menu based on what is available from the farm. Barber goes beyond the farm-to-table movement and advocates for a completely new concept of what our plate should look like. He draws on the wisdom of farmers and seed breeders as well as his own experiences as a chef to revolutionize the way we think about our meals. Alice Waters’ name is synonymous with the slow food movement. Waters focuses on gathering quality and seasonal ingredients for maximum flavor. In her book The Art of Simple Food she returns to basic culinary skills every chef should know. Her passion for local, sustainable, and seasonal food is evident throughout this cooking primer. Waters is the executive chef at Chez Panisse Restaurant in Berkeley, CA, and the Vice President of Slow Food International. After working as a chef with little regard to the season or location of her ingredients Ann Cooper changed her approach in the early 2000’s. Her book Bitter Harvest dives into what she’s learned about the role of agribusiness in food and how consumers can protect themselves. She also educates consumers on how they can encourage more sustainable food. Cooper is the Director of Food Services for Boulder Valley School District in Boulder, CO, and founder of the Chef Ann Foundation, where she works to revolutionize the way children eat in schools. Mind of a Chef fans will be familiar with Sean Brock, the tattooed chef known for seed saving and Southern cuisine. His book, Heritage, includes recipes, photographs, and stories about the roots of his ingredients. Brock is known for working with ingredients that are on the brink of extinction. He grows them on his own 2.5 acre farm and supports area farmers working with unique ingredients. He is the executive chef of Husk, which has locations in Charleston, SC, and Nashville, TN. Even the most seasoned chef can get stuck using the same types of fish over and over again. Chef Barton Seaver created For Cod and Country to encourage cooking with a greater variety of fish to improve sustainability. The cookbook is organized by season and provides suggestions for seasonal sides and seasonings. Seaver is an active voice for sustainable fishing and has used his role as chef to advocate for increased conservation. 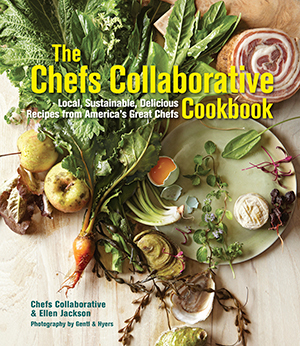 The Chefs Collaborative Cookbook is a collection of recipes from more than 115 chefs. The collection is curated by the Chefs Collaborative, an organization founded by visionary chefs who saw the importance of sustainable agriculture in cooking. The founders included Rick Bayless, Michael Romano, Alice Waters, and more. This cookbook provides recipes and suggestions for seasonal, sustainable meals for the at-home chef. Jose Garces began learning to cook from his Ecuadorian grandmother as a child. Those early experiences played a critical role in his culinary style, which shines in his book The Latin Road Home. This cookbook, travelogue, and memoir showcases Garces’ interpretation of traditional Ecuadorian, Spanish, Cuban, Mexican, and Peruvian cuisine. Garces is the owner of more than a dozen restaurants nationally and the 40-acre Luna Farm in Ottsville, PA. Luna Farm supplies Garces’ east coast restaurants with vegetables, fruits, eggs, and honey year round.